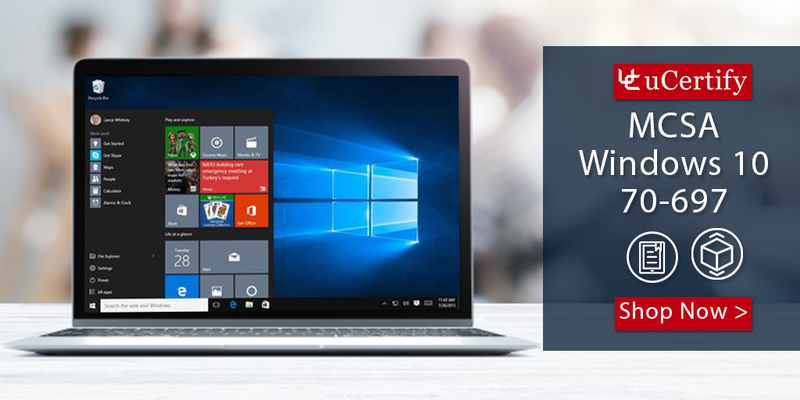 Gain hands-on expertise in Microsoft MCTS certification with 70-697 – Configuring Windows Devices complete course. Performance-based labs simulate real-world, hardware, software & command line interface environments and can be mapped to any text-book, course & training. The MCTS certification cert guide is a complete package of course and performance-based labs that cover all the objectives of 70-697 exam and include topics such as managing identity, remote access, apps, updates and recovery, data access and protection; planning desktop and device deployment, Microsoft Intune device management solution; and configuring networking and storage. The 70-697 labs offer hands-on learning that increases student engagement by making connections between the classroom and the real world. You can also take live-labs which is an add-on component to enhance your learning experiences. Live-lab is a real computer equipment, networked together and conveniently accessible over the Internet using virtualization. Microsoft Certified Technology Specialist (MCTS) certification is an entry-level training program designed to ensure proficiency and skills in technical knowledge. The MCTS certification exam certifies that the professional has the ability to understand the fundamentals of technical concepts. Microsoft certification program validates the skills and expertise of an IT Professional using Microsoft technologies. The MCTS certification 70-697 exam validates a candidate’s fundamental knowledge and skills for building solid identities, protection of content (data loss protection), mobile device management policy, virtualization with Hyper-V, application management using the Company Portal and the Windows Store. So, get yourself enrolled in the uCertify study guide and prepare for the 70-697 exam to have the Microsoft MCTS certification. Q. What is the 70-506 exam? A. This exam is designed for software developers who are creating rich Internet-based applications using Silverlight. The exam focuses mainly on Silverlight 4, but also covers core Silverlight concepts. Prior to preparation for the 70-506 exam, you will in all probability necessitate defining your objectives and making out if you will actually need the Microsoft 70-506 certification exam. The most excellent approach to do that is to coordinate your objectives with that of exams and if both are in a similar way, you require being clear in your mind that 70-506 possibly will be the best exam available for you. Q. What are the prerequisites for the 70-506 exam? Q. What certificate and credit does the 70-506 exam provide? Q. How many questions are asked in the test? A. You will be required to attempt approximately 45 to 55 questions. Q. What is the exam fee? A. The exam fee is US $125. Note: Currently, the net price for taking test 70-506 is US $125. Net price does not include applicable taxes, vouchers, promotions or membership discounts you may have. The exam is subsidized in India and China. The net price for taking test 70-506 in India and China is US $50. Q. What is the duration of the test? A. Users are required to attempt all questions in 120 minutes. A. This test consists of Multiple Choice, Hot Area, Drag and Drop, Build list and reorder, and Build a Tree questions. The test can be adaptive and simulation questions might be asked. Q. What is the passing score? A. The passing score of the exam is 700 out of 1000 score marks. Q. What is the test retake policy? A. If you do not pass test 70-506 the first time, you may retake it at any time. If you do not achieve a passing score the second time, you must wait at least 14 days to retake the test a third time. A 14-day waiting period will be imposed for all subsequent exam retakes. If you have passed an exam, you cannot take it again. Increased opportunities on the job: These opportunities range from increased salary and bonus to project involvement and promotion. Increased breadth of knowledge: Certification is a catalyst for learning new technologies in a structured and comprehensive way. Increased value to the organization: Organizations with 25 percent or more of their staff certified have shown to deploy projects on time and within budget more often, rely less on external support, have less downtime, and have higher user satisfaction with their IT staff. Q. Is the 70-506 exam right for you? A. The test is appropriate for you if you are developers who create and maintain rich interactive applications (RIA) using Silverlight 4. Candidates may have additional experience with previous Silverlight versions. Q. What are the skills being measured for the 70-506 exam? Q. How to prepare for the 70-506 exam? A. We designed 70-506 preparation kit to help you get certified effortlessly. Now you don’t need to spend your time and money searching for study materials, books, etc., this TS: Silverlight 4, Development exam preparation kit contains everything you need to get certified. Just follow the instructions; focus on the study material and getting certified will be easy. Don’t take our word for it; decide the quality of our PrepKit yourself. Download the trial version of the PrepKit now to get over 15 questions and related study notes, absolutely free. Once you are convinced, you can buy this PrepKit to get all questions and study notes. And of course, we trust our PrepKits so much that all our PrepKits are backed with full money back guarantee in case you do not pass the TS: Silverlight 4, Development exam. Q. Where to take the test? A. You can register with a Prometric testing center. You can also register for the exam online at your local exam center or a regional contact center. (Prometric testing Centre). Q. How can I register for the 70-506 exam? A. You can register for the exam through a Prometric Test Center Locator at Prometric. You will have to go through a complete registration process, make payments and schedule the date and time for the exam. Q. How to locate a testing center? Q. How to schedule, reschedule, cancel, or confirm the exam? Q. How to update personal information, viewing test history, etc? Q. What can I expect from Microsoft if I pass the 70-506 exam? A. After passing the exam, you will achieve the MCTS: Silverlight 4, Development status. Q. How long does it take to receive my Welcome Kit? A. The certificate can be ordered through the Microsoft Certified Professional member site by clicking on â€�Download certificates under Program Benefitsâ€�. It will take about 30 days to receive your welcome kit after passing the exam and placing the order. You can also download the same certificate from the MCP Secure Site. Even though the certificates are absolutely free, there will be shipping and handling charges which you have to pay. The Shipping and Handling are $9.95 USD for the first certificate and $0.99 USD for each additional certificate up to six total certificates. Q. What is the validation period? A. This exam expires when new and more relevant Microsoft products are released. Q. How to get score report? A. The score report of the exam will be delivered immediate on test completion at testing center. Posted in Everything you want to know, MCTS.